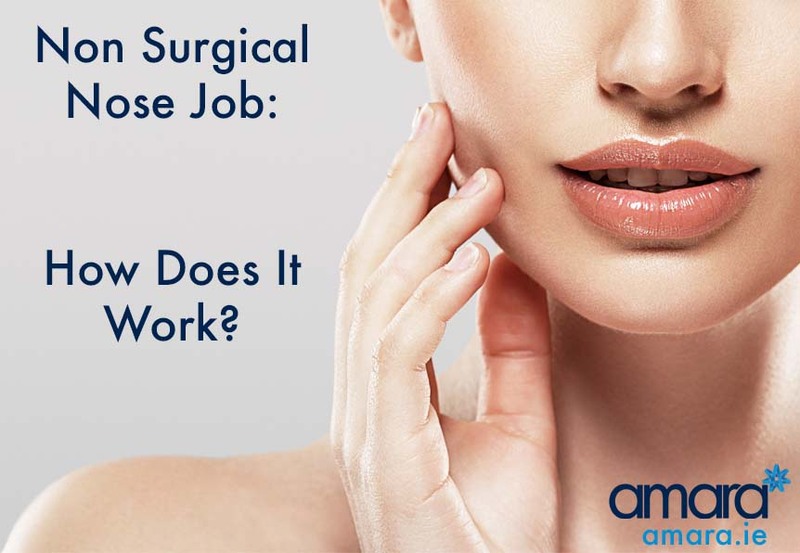 Non Surgical Nose Jobs : How Do They Work? Everyone has that something that they’re concerned about – usually it’s only something we care about. For many men and women this is the shape of their nose, now we can alter our nose without drastic surgery or Rhinoplasty. I’ll be honest for a massive change in shape or size to the nose surgery would be necessary. However simply using Dermal Filler we can alter the shape and subtly enhance and straighten the nose. But Wouldn’t Adding Dermal Filler Make My Nose Look Bigger? This is a common misconception that adding volume would make your nose look bigger! But by adding dermal filler we actually just smooth out the nose. For instance many people may have a dip in their nose or a prominent bridge. By adding filler in the dip of the nose we can even out the shape. This makes the nose look straighter and more even. A non surgical nose job is virtually painless! Like all filler treatment an ice pack is used before to numb the area. Any discomfort felt is simply the needle entering the skin. Ice packs can be used later if there is any discomfort. We use Juvederm Hyaluronic Acid filler which contains a local anesthetic. Generally the treatment takes under 5 minutes, you will have a consultation first with the doctor who will go over the treatment and guide you to if you are suitable and what you can expect. This depends on the amount of Filler you need – typically 1 ml is ideal which costs €450. 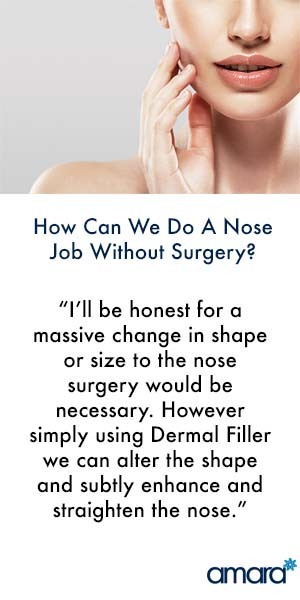 Are you interested in reshaping your nose or have you already had surgery and want to complete your final look? Book in now for your free consultation! Hi my tushar Patel and I am 30 years old men.i had a accident when I was 6 months old and I had a problem with nose I can’t breathe properly.and year by year my nose go widely (like Chinese).when I was 20 years old I had nose surgery but t after few years I have same problem.so I want nose lift and how much it will be totally cost for full treatment.could you please reply me.many thanks. With a Non Surgical Nose Job with Filler we can only add to the volume of the bridge of the nose. This is to straighten the appearance of the nose so unfortunately the nose cannot be made small with filler. How long does the filler last before having to get it topped up? With Juvederm Filler typically the results last between 12 and 18 months, with many people preferring to top it up around every 12. HI Michele, Filler is only available to those 18 or over. Please note that Filler can only be added to the bridge of the nose but a consultation would first be needed to see if the treatment is suitable. Hi Janet, Currently we do not offer non-surgical procedures to anyone under the age of 18. Just wondering if I could be booked in for a non surgical nose job? I have a hooked nose with the tip pointed down and a large dorsel hump on the bridge. Is there a waiting list or can I come straight in? Hi, I have a collapsed lower lateral cartilage (more of a dent in the side of my nose on one side). Would i be a suitable candidate for the non surgical rhinoplasty? Unfortunately, typically only the bridge of the nose is treated with dermal filler so I fear that it would not be suitable. Hi, I cannot find the answer to my question anywhere! I have a deviated septum and my nose is more to the right of my face.My nostrils are different sizes because of this. Will nose filler be able to straighten and even my nostrils. It’s impossible to tell from your description. The likelihood is no, however, as non-surgical rhinoplasty only ever adds volume. We would be happy for you to come in for a no-cost chat with one of our doctors to make this definitive. We would also be able to give you a recommendation for an excellent plastic surgeon who would likely be better able to help you.